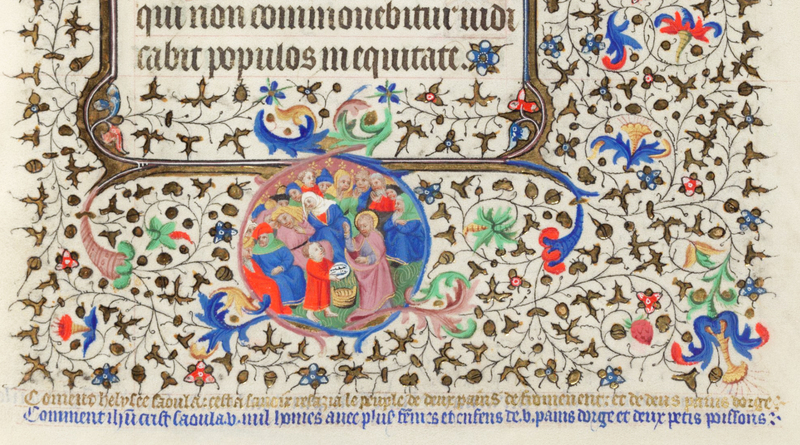 The Bedford Hours – currently treasured at the British Library – is a manuscript that underwent several stages of creation, and perhaps this is one of the reasons of its charm, thus an air of mystery keeps lingering on a few matters such as its production date and original patronage. In both regards, the most basic questions remain unanswered: When was it made? For whom? Scholars have come a long way in the course of their research and a few things can be stated beyond doubt. For example, we now know that it dates to the early 15th century and that it was owned by the Lancastrian Duke of Bedford and his wife. 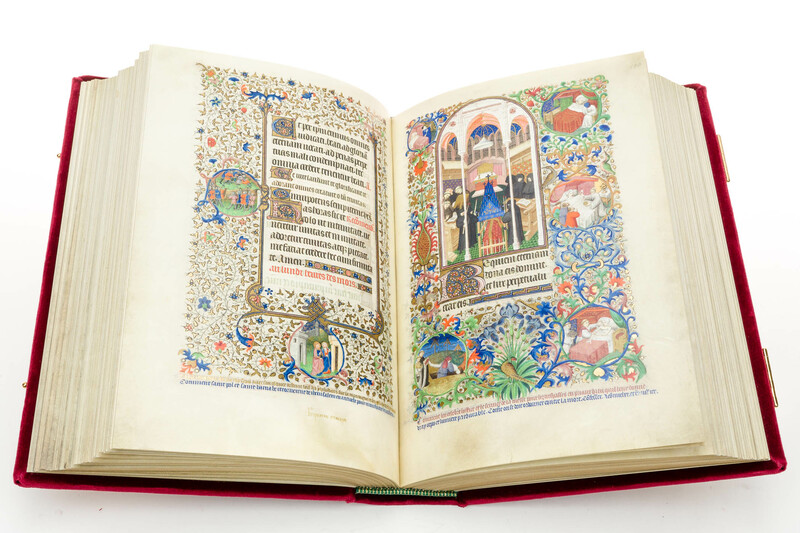 In case you missed it: check out our high definition picture gallery of the Bedford Hours facsimile editions – you can also watch a short video highlighting the most significant details and information! Bedford Hours – Who Was it Made for? Evidence of this ownership is the frequent inclusion of the couple’s joint coats-of-arms, with the golden emblem of the woodstock for the duke and the Burgundian laurels for the duchess. Surprisingly enough, the arms are always inserted into spaces originally left blank; the devices are always inserted into gaps left blank by chance and not once do they occur in the original iconographic structure, may that be a miniature or a border decoration. This would mean that the manuscript was being personalised for the Bedfords only after it was completed. 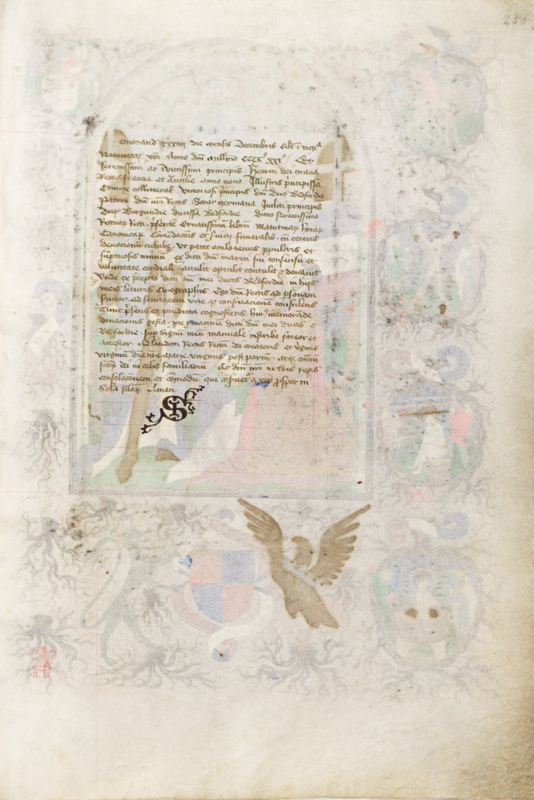 A single instance of the duchess’ motto appears in an original part of the design which lead scholars to believe that the manuscript was begun for Anne of Burgundy before her marriage in 1423. Be that as it may, we are certain that the codex was in the duchess’ possession in 1430, for an inscription added at a later stage (f. 256) records the presentation of the volume to her nephew Henry, legitimate heir to the crown of France and grandson of Charles VI. The reason why I mention Charles VI is also because some scholars believe that the manuscript might have belonged to the dauphin Louis de Guyenne, drawing attention to some illumination which seem to allude to Charles VI and his wife. If this were true, we would certainly be dealing with spectacular royal descent: from Louis de Guyenne to Anne of Burgundy to Henry IV. As previously mentioned, the Bedford Hours was an ongoing project for a long time with its final upgrade taking place in 1430. Although the Duke of Bedford entrusted this task to the Bedford Master it appears that there was no clear iconographic plan, for, after these last additions – albeit unparalleled – the manuscript results quite chaotic, i.e. full-page miniatures left dangling with no conceptual structure. It seems that it was only when they decided that the manuscript would be presented to Henry VI that the Bedford Hours found its purpose. For the Bedfords decided to transform it into a religious and educational compendium, with each and every marginal illustration explained. So, as you can see, after providing you with the facts both the creation date and the original patron remain still quite obscure. However, we may consider ourselves lucky when we think of the inscription recorded by John Somerset on f. 256 which informs us about the history that followed after the Bedfords’ ownership. It is striking to know that without this trace we would never have guessed that the cycle of marginal pictures was meant to be self-explanatory and that was only later provided with captions to educate the child king Henry VI. It also makes one wonder about the amount of things that we have missed and that we will never know.